How to make a Contact form? Every kind of website, let it be related to business or non-business or even just a normal blog, they all require a contact form. 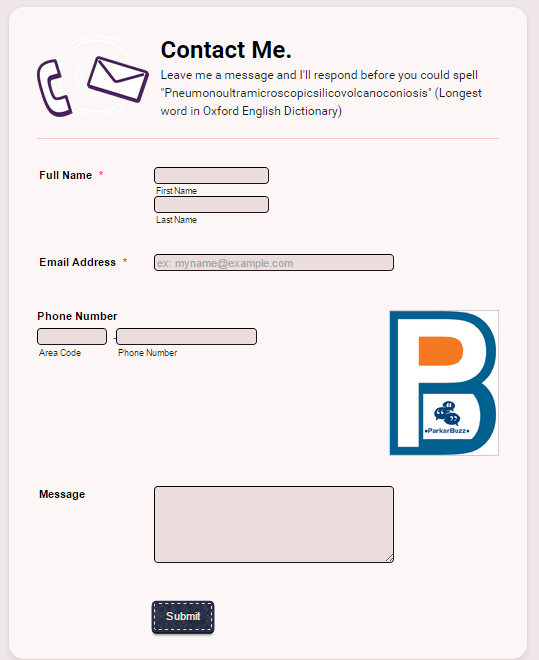 A contact form helps the reader to get in touch with the content writer either for feedback or enquiry. Well and jotform.com makes it very easy to build this smooth connection between the user and the blogger. I made the contact form for this website using Jotform.com. I started off by heading from “form tools”. But after I wrote; “Contact Me” ; It seemed very plain for me. I wanted to add a little life to it. It is very important to make your contact form as lively as possible. Well, not “over lively” but surely “make it look good” sort of lively. So I added an image to my header. It still seemed as if something was missing. Hence; I added a sub text. Now, I was confident about my contact form heading. It looked pretty good to me at least. I moved on to “Quick Tools” where I found Full Name, Email and Phone Number tool. I simply had to drag and drop them. 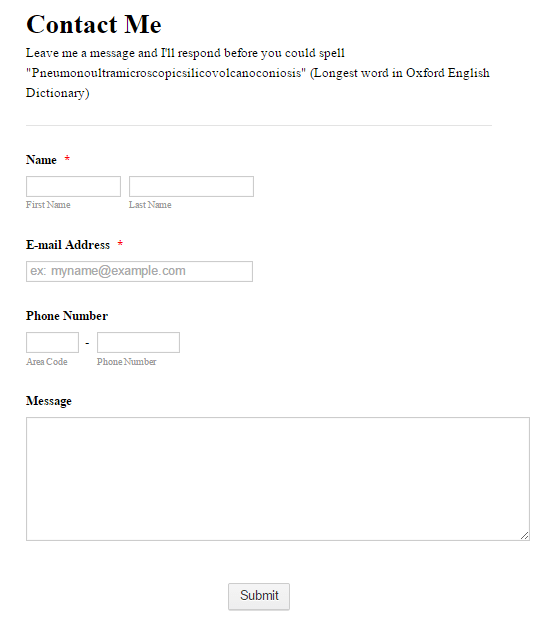 After this I went back up to form tools and selected “text area” to as to add my final “message” section. Furthermore, an end to my contact form by adding the “submit button” which was found in form tools as well. Now after the basics were done. I clicked on “form preview”. It showed exactly how my form looked. But I was quite unhappy as other than my header everything looked dull. So now I had to make my form look, as I said earlier, “lively”. At first, I added my website’s logo beside the phone number by shrinking the phone number column. Adjusted the logo size to fit perfectly into the form. Then, I clicked on “form designer”. Now form designer definitely has to be one of jotform’s best features to make your form look really professional and amazing. It had wide range of options and you can exactly design and customize your form the way you want to. And trust me, I bet I haven’t even used most of the features that Jotform Design provides. Within a matter of minutes, my dull form looked amazing and professional after the use of Jotform design. You can add colours to your frame. Change your background. Add Background images, change your font, change the frame size, decide the distance between each frame etc.